An engaging and thoughtful inquiry into Christianity for Unitarian Universalists and other spiritual seekers. Helps to stimulate dialogue about Jesus Christ, whether or not we find him central to our faith life. With his customary warmth and hospitality, McLennan poses and responds to a series of provocative questions. They address Jesus as historical figure and Jesus as the present Christ; they explore the reality and meaning of the Christmas and Easter stories, the Trinity, Christ’s divinity, miracles, salvation, religious pluralism and exclusivism, and more. 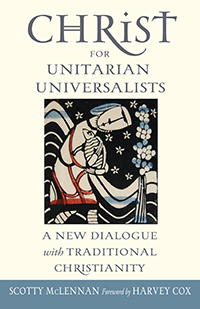 Rather than proselytize, Christ for Unitarian Universalists seeks to stimulate dialogue about Jesus Christ, whether or not we find him central to our faith life. It aims to build bridges and cross the great cultural gulfs in our society. It addresses frank questions with integrity and intellectual honesty. Yet it also presents a sincere and genuine sense of love as embodied in Jesus Christ that is so heartfelt, so unconditional, and so revolutionary it will take your breath away. For the free online study guide, click here. 1. What does it mean for Unitarian Universalists to talk about the living Christ? 2. Who was and is Jesus, really? 3. The birth story: Why put Christ in Christmas? 4. What’s in the Trinity for us as Unitarians? 5. What significance can we find in crucifixion? 6. What could Christ’s resurrection mean to Unitarian Universalists? 7. What can we do with Jesus Christ’s supposed miracles? 9. How can we deal with Jesus Christ as the way, truth, and life? 10. What’s really left of Christianity in the face of Unitarian Universalist rationality and doubt? 11. Could Unitarian Universalists adopt Martin Luther King Jr.’s understanding of Christ? 12. How can Christ help us in our social justice efforts? 13. How might we talk to evangelical Christians about Christ? 14. What can we say to people of other religions (or none) about Christ? Why in the world a book on Christ for Unitarian Universalists (UUs)? Less than 20 percent of us identify as Christians. But more than 70 percent of Americans identify as Christian, and we UUs are only 0.3 percent of America at best. So this is primarily a book to help us talk intelligently about Christ with our Christian friends. We Unitarian Universalists actually have had a lot to say about Christ over the years as well (that is, centuries, and perhaps even millennia), and we have generally done that in dialogue with mainstream Christians. But not much anymore. This book is meant to encourage us to do so again, not just by referencing our history, but also by speaking freshly as Unitarian Universalists in the twenty-first century. Why in the world a book on Christ for Unitarian Universalists, when we virtually never use that title for the historical figure of Jesus of Nazareth? Again, primarily because that’s how the rest of the world speaks. They refer to themselves and others who stand in the tradition of Jesus as Christ-ians, not Jesus-ians. Why? Because they tend to be less interested in the Jesus of history than in the Christ of their present faith. Jesus lives with them in their daily lives now as the Christ. Christ is an honorific title that technically means “the anointed one” of God. For most Christians, Jesus is the post-Easter Christ, the resurrected Christ, who is actually with them now in real time—who companions them and comforts them and challenges them in their daily lives—not just a prophet and teacher of first-century Israel. “Scotty McLennan has produced a profoundly personal, theologically deep exploration of key Christian concepts and how they have been used in service to liberal values by Unitarian Universalists, and by respected theologians ranging from the writers of the canonical epistles to Marcus Borg to Martin Luther King Jr. While it is not intended to convert Unitarian Universalists to UU Christianity, it may well open some doors to spiritual exploration and growth that had previously been impenetrable to people who thought Jesus or Christianity had nothing to offer them. Scotty McLennan’s Christ for Unitarian Universalists confronts head-on the doubt and fears that Unitarian Universalists have had about Christianity and re-interprets them through the lens of our liberal religious faith. Written for both Christian and non-Christian Unitarian Universalists, this book is a goldmine of history, theology, and wisdom from his lived experience as college chaplain, Unitarian Universalist minister, and practicing Christian. As a Unitarian Universalist and a Christian, as a sceptic and a believer, Scotty McLennan has brought together his disparate worlds in a remarkable book. He presents us with thoughtful, serious, and compassionate Christians who live their faith—and question it. His clear, sensible writing and irenic intelligence make this a must for any Unitarian Universalist interested in moving beyond caricatures to real people, however different from most of us.